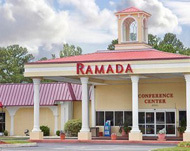 Enjoy your holiday stay at the Ramada Inn Conference Center. The hotel features high speed internet access, complimentary breakfast, cable TV, free local calls, hair dryer and iron/ironing boards. There is also an on-site restaurant and lounge. The Ramada Inn is just a few minutes away from the Wilmington Airport, Wrightsville Beach and the USS North Carolina Battleship Museum. The hotel also has a large outdoor pool, free access to the nearby Gold’s gym, free morning newspaper and free truck and RV parking. The meeting facilities can accommodate up to 300 people.